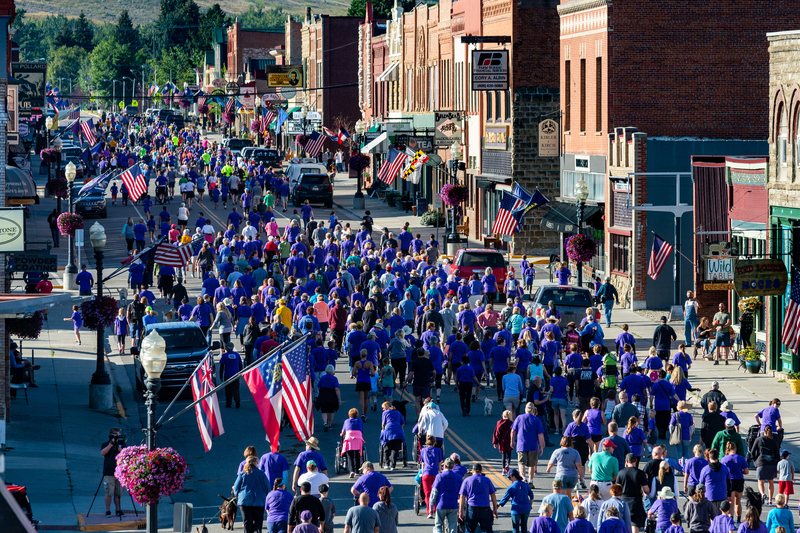 The Fun Run is an Annual Event for Charitable Organizations in the Carbon County Area. 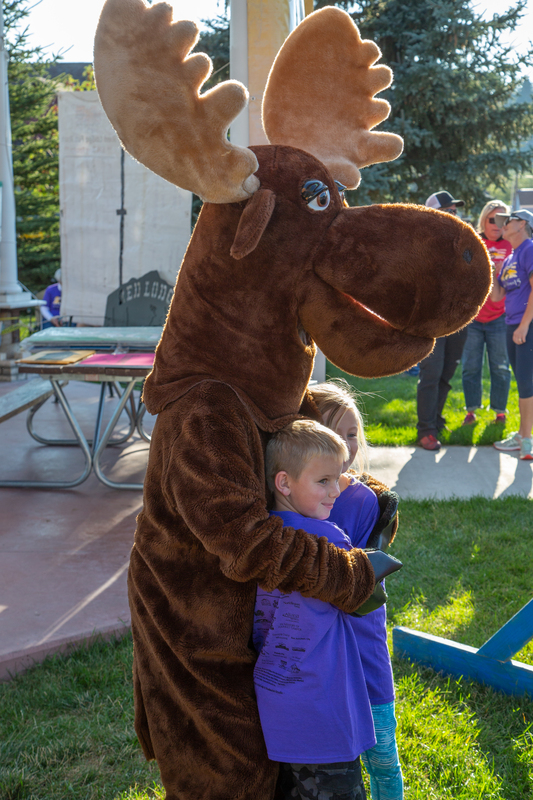 Come run with the Moose and help raise funds for local charities!! The Fun Run includes a 10K and 5K Run and 2 Mile Walk. Runners and walkers of all ages are invited to participate and dogs on leashes are welcome.There is activities for everyone, music, free BBQ burgers, and much more! COST: Registration is free until day of event. Kids under 6 are always free! WHO: All ages are invited to participate and dogs on leashes are welcome! PRIZES: Prizes are given out to the top winners in each age category. 10K and 5K races are timed. 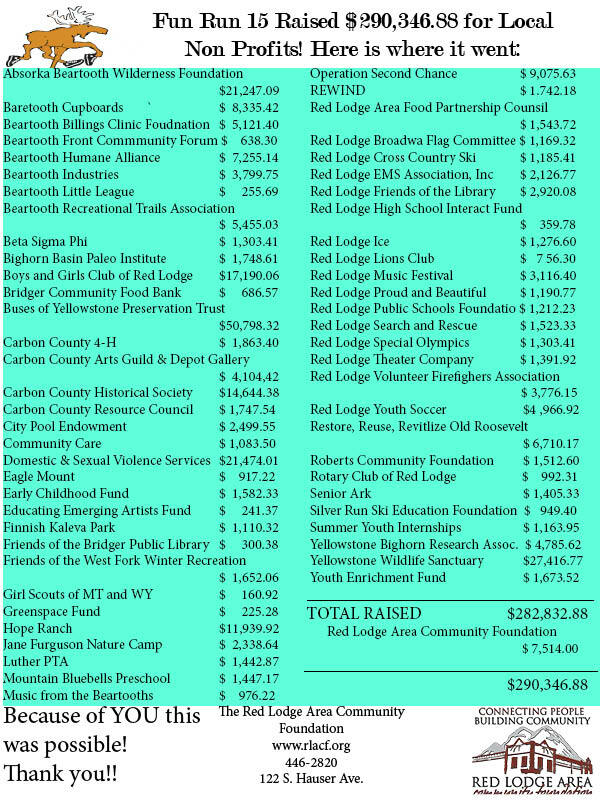 In 2018, we raised over $290,000 for over 60 charitable organizations in the Red Lodge Area! That amount put us over 2.7 million dollars raised in the past 14 years! All thanks to the supporters of the Fun Run! The funding from the Fun Run supports Nonprofits in our area so that they can continue to focus on their missions and spend less time fundraising and more time making impacts. Thank you to all the racers who come out for the Fun Run every year. Whether you run, walk, or trot your support and participation makes Fun Run a great event for the community every year! How did you do at the race? Check out Fun Run 13 results and years previous. For 2017 race results, click here. For 2016 race results, click here. For 2015 race results, click here. Event sponsors are an essential part of the Fun Run, they are a distinguished group of community leaders who value philanthropy and inspire all of us to give. Being a sponsor is a special opportunity to support the impactful work of the local nonprofit community and to encourage other donors to give to charity. It’s also an opportunity to prominently be displayed on marketing materials (posters, registrations, and T-shirts) to generate sales and business. What is a MATCH FUND donor? A Match Donor is a Donor whose contribution is receipted as a charitable contribution. Their contribution is an exclusive venue where a single donation benefits all of the participating charitable organizations. All Match Fund donations are retained in the Match Fund.